Hi friends there are lot of tips and tricks available on different computer programs. After using these tricks you will be surprise that that work also done by the computer without using any extra effort. These tips and tricks may be surprised to any other person when you give demonstration regarding these tips and tricks. 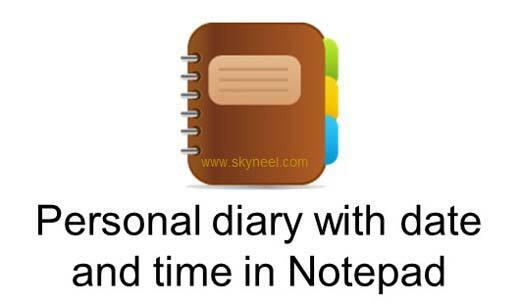 Today we talk about a trick how to create personal diary with date and time in Notepad program. Lot of persons know very well about the Notepad program. Notepad program is a simple text editor program which is generally used to create or edit any text files in ASCII (American Standard Code for Information Interchange) format and you can also use this program to create web pages by writing the code in HTML (Hyper Text Markup Language) format. Notepad is a first stage which is used to create web pages and also make any kind of decoration on any web page using HTML programming. In this article today we known how you could create create personal diary with date and time in Notepad. When you open this file notepad program automatically shows current date and time, you can set your appointment detail at the below of given date and time and save this file, next time when you again open this file, Notepad again shown current date and time and you can set other job status in this file. To do this you have to take following given few easy steps in the Notepad program. Step 1. Open Notepad program either by clicking on the Start > All Programs > Accessories > Click on the “Notepad” program or, You can also press WIN + R shortcut key to open “Run” box then type ” Notepad ” and press enter or return key. Step 2. TYPE .LOG in capital letter in the active window of Notepad. Step 3. Save this file by pressing Ctrl + S shortcut key or click on the File menu > select Save or Save As option > Type the name of file, set the location where you want to save this file then click OK. Step 4. Now, again open this file by double clicking on the saved file icon of notepad, it automatically shows current date and time, now type your current appoint or task which you want to done on that time. Step 5. Now close this file and if you want to set another task then again open this file and repeated Step no 4 again. I hope you like this create personal diary with date and time in Notepad guide. Use this trick on your system and watch the result then after share your knowledge with your colleague, friends and family members. Thanks.